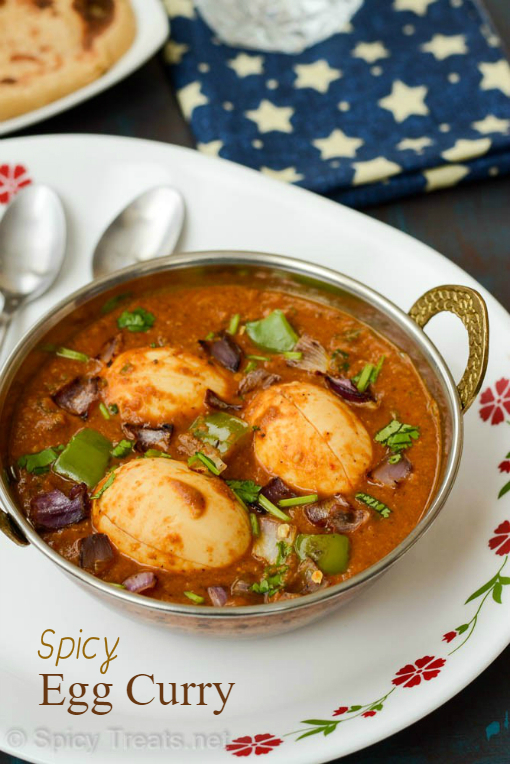 Today's recipe is a spicy Egg Curry that is prepared using freshly ground spices & tomato puree. The preparation process may look difficult and time consuming but actually you can make this curry in a jiffy. Last Week, I prepared this Egg Curry for our Dinner. At home, kids were sick and I wanted to make something spicy for them and this Egg Curry using freshly ground spices came to my mind. Also, i wanted to share this recipe here, so without any second thought prepared and clicked it. 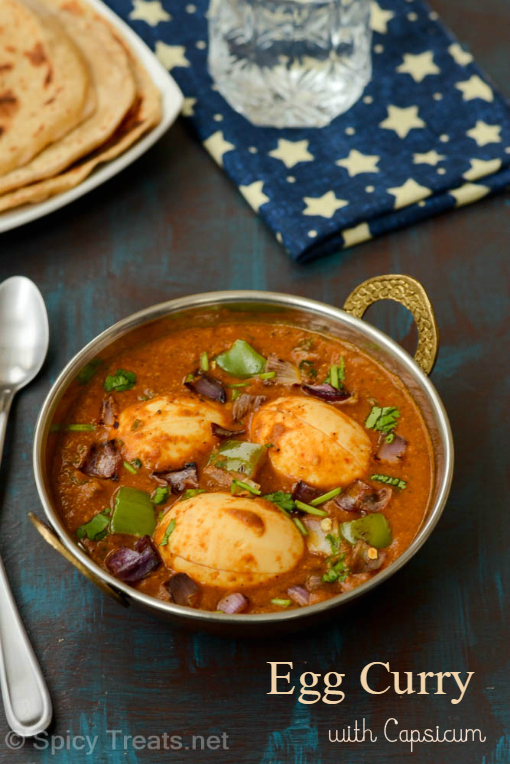 I served this Egg Curry with Jeera Rice for kids and I had it with rotis. 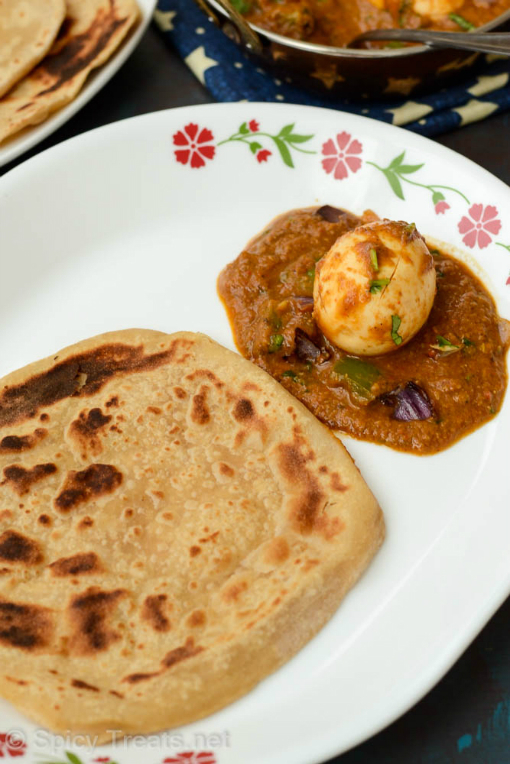 Egg Curry pairs well with both rice & rotis. Dry Red Chilli 2 no. First boil eggs and peel the shell from boiled eggs and make 2-3 slits and keep aside. Then heat oil in a pan to roast & grind spices, after that add fennel seeds, clove, cinnamon, pepper corns, dry red chilli, coriander seeds and fry well. And then add cashew nuts, onion, ginger garlic, poppy seeds and saute for 2 minutes. Lastly add dry coconut and stir well. Switch off the stove and allow this to cool for a while and then grind it to a fine paste. Now heat 2 tsp oil in a kadai, add the tempering ingredients and fry well. Then add the ground onion masala paste and saute for 2 minutes. After that add tomato puree and saute till moisture dries and oil appears on kadai edges. Then add 1 to 1.5 cups of water, enough salt, turmeric powder and bring it boil. Meanwhile, heat few drops of oil in a pan, and roast diced capsicum and red onions. Then to the boiling gravy add boiled eggs, roasted capsicum and red onion and simmer for another 2 minutes. Finaly add some finely chopped cilantro and switch off the stove. That's it..Spicy & Flavorful Egg Curry ready. Serve hot with Phulka, Jeera Rice, Pulao or even with plain rice. 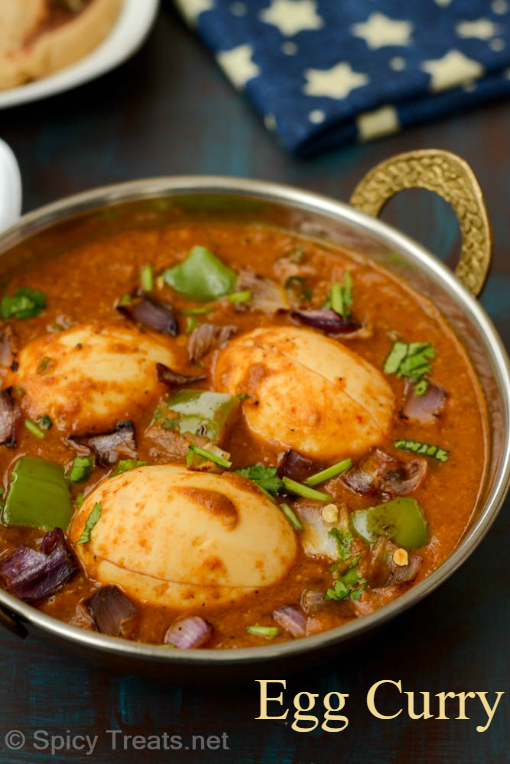 To this curry, you can add up to 6 eggs. Adding roasted capsicum and red onions is optional but sure it give good flavor and taste to the curry. The curry tend to thicken upon cooling, so adjust gravy consistency to your preference. Labels: Dinner, egg, kids special, lunch, non-veg curry, side dish.